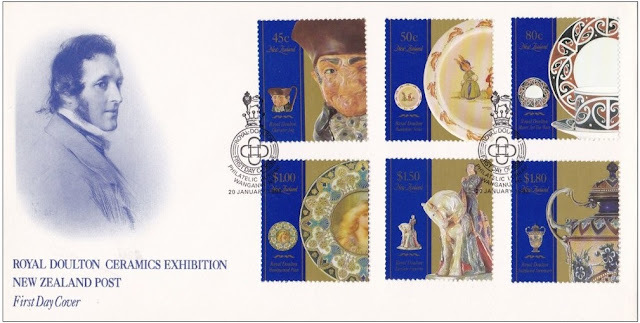 This issue commemorated the 1992 - 1993 CourierPost Royal Doulton Ceramics Exhibition in New Zealand. The exhibition included over 750 items with over four-fifths of the items displayed coming from family collections in New Zealand. The Royal Doulton Company is one of the most renowned English companies producing tableware and collectables, with a history dating back to 1815. 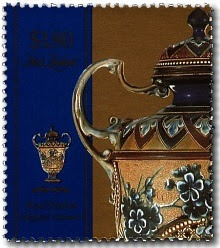 In 1901 King Edward VII granted the Burslem factory the Royal Warrant, which allowed the business to adopt new markings and use the Royal Doulton name. This is an issue that neither Allan or I knew much about. Sure, I have a set in my collection with their captions underneath but that was as far as I'd ever gone. Now when we came to feature these on their own page we spent a long time trying to find suitable images. The problem is that blue block down the left-hand side of each stamp. It is so dark that the value and other information is almost impossible to see. 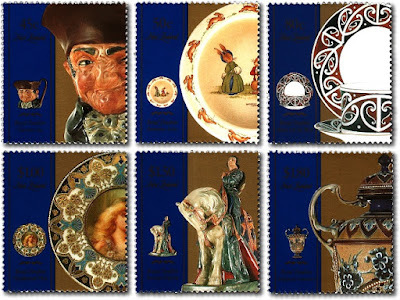 The real stamps look slightly better but they certainly do not photograph well. 45c - Character Jug - Old Charley (1934). One of a range of character jugs first produced at Burslem in 1934. The character jug, featuring only head and shoulders, was an original Doulton development of the traditional full figure Toby jugs which dated from the 18th century. 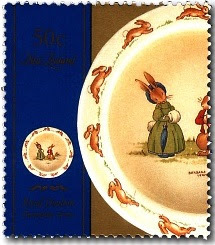 50c - Bunnykins Plate - The Proposal (1930s). The range of children’s ware most commonly associated with Royal Doulton is the perennially popular Bunnykins series, first introduced in the 1930s. The whimsical rabbit family was the creation of Barbara Vernon who passed most of her life in a convent. Since her original drawings, over 150 designs have appeared. 80c - Maori Art Tea Ware (1907). 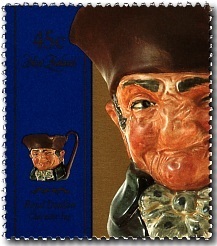 Royal Doulton has produced several ceramic series on New Zealand themes. They are 'Kia Ora' stoneware (1907); 'Māori Art' teaware (1907). 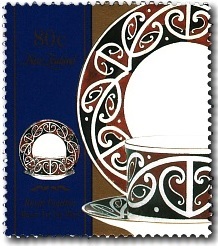 Souvenir wares, and kiwi teapots and plates for the Silver Jubilee of Canterbury (1900). The death of Richard John Seddon (1906) and the New Zealand International Exhibition in Christchurch (1906). $1.00 - Handpainted Plate - Ophelia by George White (1903). By George White 1903. This Burslem plate is an example of the extremely high standard of Royal Doulton ceramics which made their way to New Zealand in the early part of the century. They were snapped up by collectors eager for quality and artistic innovation. $1.50 - Burslem Figurine - Saint George (1950). In the early 1890s Charles Noke began experimenting at Burslem with figurines, mainly of characters from Shakespeare. Since then many outstanding sculptors have helped to develop the vast range of Royal Doulton figures still in production today. $1.80 - Saltglazed Stoneware Vase by Eliza Simmance (1892). By Eliza Simmance c. 1892. 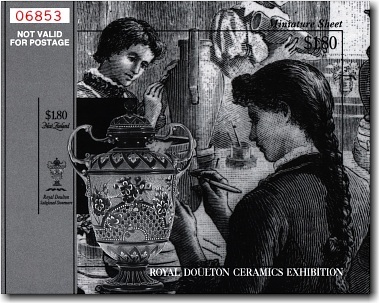 Doulton was ahead of its time in using women as artists and designers. The vase is an outstanding example of late Victorian art pottery, which aimed deliberately to be creative or artistic as opposed to merely utilitarian. 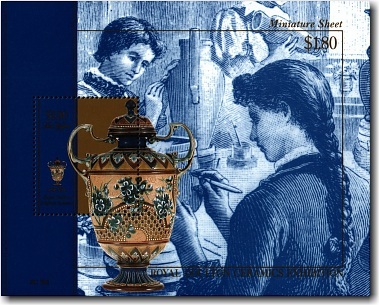 This issue had the usual collector items of a miniature sheet and two First Day Covers. First Day Cover - 20 January 1993. 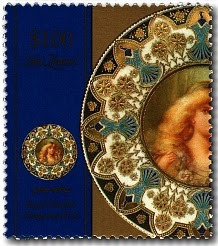 Exhibition Miniature Sheet with one $1.80 stamp. 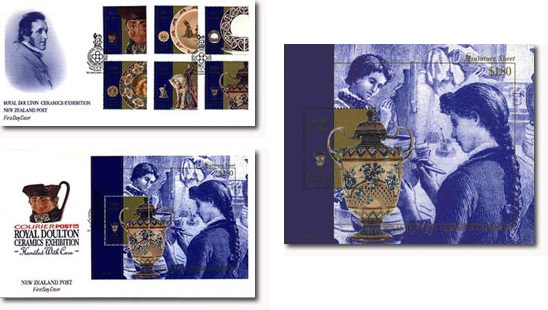 Exhibition Miniature Sheet with one $1.80 stamp (Black & White). 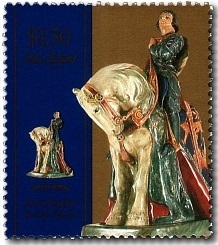 These stamps remained on sale until 20 January 1994.